By plucking an array of multi-colored strings, which are layered over the large array of high resolution screens, visitors can explore over 100 unique color stories as vibrant images and short videos appear before them. Strum a red cord, for example, and learn how a male cardinal bird colors his vibrant red feathers with pigments from food; strum a yellow cord and see how a yellow leopard’s spotted coat allows this predator to blend in with shadow and light while moving through tall grass. 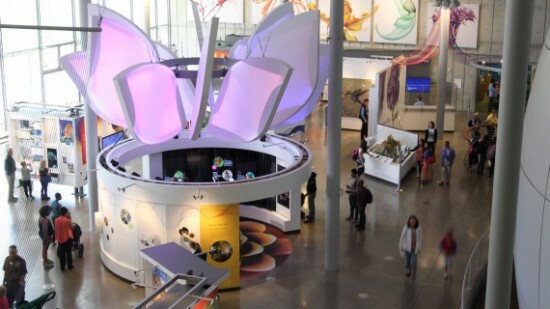 The eye-catching cylindrical installation is part of the permanent exhibition “The color of Life” that opened in June 2015 and was created by Tellart in collaboration with the California Academy of Sciences. It was prototyped using Arduino Uno and it’s currently shortlisted for the Interaction Awards, representing excellence in interaction design.